Some 800 skeletons of captive-bred lions can be legally exported from South Africa this year, the government said Wednesday, meeting demand for the bones in parts of Asia while alarming critics who believe the policy threatens Africa's wild lions. 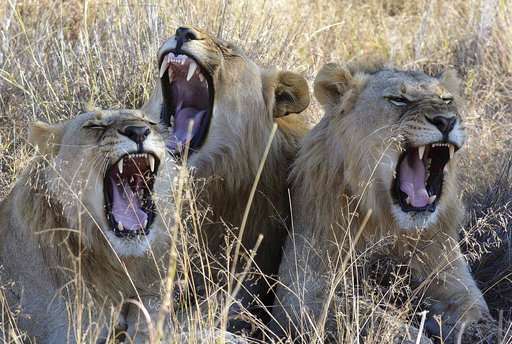 The lion bone industry, which supplies a traditional medicine market, has become a key part of the debate over how to protect the continent's wild lions, which are under pressure from human encroachment and poaching. The lion bone quota meets international guidelines on wildlife trade and a three-year study with annual reviews will assess its impact on wild lions, South Africa's environmental affairs department said. "South Africa reiterates its concern that if the trade in bones originating from captive-bred lions is prohibited, lion bones may be sourced illegally from wild lion populations," the department said. Some conservationists, however, say the legal trade may be fueling demand for bones, whether from captive-bred or wild lions. They also note that many of the captive-bred lions are killed by paying clients in a practice described by critics as "canned hunting." A 2015 report on lion bones said demand in China and Southeast Asia followed stronger conservation measures aimed at protecting tigers and other Asian big cats, possibly prompting dealers to turn to African lions as a substitute. Legal exports of South African lion skeletons increased from about 50 skeletons in 2008 to 573 in 2011, the report said. Panthera, a global conservation group, said in March that the South African government's plans for a lion bone quota this year were "arbitrary and potentially devastating for wild lion and critically endangered tiger populations." The South African trade feeds "a growing market among upwardly mobile Asians for luxury products such as lion bone wine" and "has grown exponentially since 2007, as lion bones have begun to fill demand for increasingly scarce tiger bones," Panthera said. The number of wild lions in Africa has plummeted by about 40 percent in the last two decades to roughly 20,000, according to estimates.